A woman has called for emergency services workers to be allowed to jump queues in cafes and supermarkets while on duty. Emma Murtagh, 42, from Heacham in Norfolk, set up a petition to campaign for firefighters, paramedics and police officers to go first in line. "It is about showing a bit of respect and caring for people," she said. The petition will be sent to major supermarket and cafe chains in the hope they could adopt a national policy. It has received nearly 400 signatures online since being launched on Friday. The Cut the Queue petition was set up just hours after Mrs Murtagh spotted a Facebook post about two paramedics who missed breakfast after being called out while queuing at a cafe. 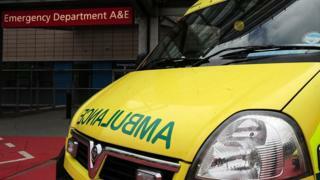 The former East Midlands Ambulance Service executive assistant said she was particularly concerned about paramedics who could be away from their stations for hours. "They are not on emergencies all the time... but if they decide they want to go and try and grab a coffee and a call comes in then they have to go," said Mrs Murtagh. "These people need our support - they do take their lunches to their station but then they can be called out - and a flask only lasts so long and they are on 12-hour shifts." The manager of the East of England Ambulance Service Trust depot at Gorleston, near Great Yarmouth, said she believed people would be "supportive" of the campaign. "Patient care is always our first concern and patient safety," said Teresa Church. "While it may be annoying to dump your coffee, obviously we're going to respond to that call. I think people are very respectful of the uniform in my experience." The BBC has contacted the firms due to be sent the petition when it ends on 1 November.